The NFL season is fast approaching, so its time to take a look at some future betting. This week, we’ll show you the odds on who will take home the NFL MVP trophy for the 2018 season. Aaron Rodgers is set as the opening favorite, moving past reigning MVP Tom Brady as a clear +550 favorite on the NFL player props. Rodgers is the clear favorite on the odds to win the NFL MVP award despite coming off a difficult 2017 season, when he was limited to just seven appearances by a collarbone injury that forced him to undergo mid-season surgery. Without Rodgers, the Green Bay Packers struggled down the stretch, finishing the season with a disappointing 7-9 record that left them out of the NFL postseason for the first time since 2008. The Packers are expected to be back in the playoffs this season with a healthy Rodgers at the helm and are +1400 to claim their first Super Bowl title since 2010. Rodgers also suffered a collarbone fracture in 2013, which limited him to just nine appearances, but bounced back in 2014, throwing for 38 touchdowns and claiming his second career NFL MVP award. Rodgers will face plenty of still competition for this year’s award with a bevy of fellow quarterbacks right behind him. Right behind the Packers signal-caller is Brady at +700, while Philadelphia Eagles quarterback Carson Wentz sits third at +950. The 40-year-old Brady guided the New England Patriots to their third Super Bowl appearance in four years after leading the NFL during the regular season with 4,577 passing yards to go along with a third-best 32 touchdown passes. Wentz was set as the favorite to claim NFL MVP honors for most of the 2017 season, while leading the league in scoring passes before suffering a knee injury in Week 14 that ended his season. He still managed to finish second with just 13 games under his belt with 33 scoring passes, and threw for over 300 yards on four occasions. Further down the NFL MVP odds is New Orleans Saints veteran Drew Brees and San Francisco 49ers quarterback Jimmy Garoppolo at +1500, followed by Seattle Seahawks do-everything Russell Wilson at +1800, while Carolina Panthers quarterback Cam Newton joins Houston Texans passer Deshaun Watson at +2000. Brees has led the league in passing yards seven times and finished fourth among NFL QBs in 2017 with 4,334 yards, while Wilson led the way with 34 scoring passes. However, the Seahawks’ 9-7 record was not good enough to get them into the postseason, and Seattle is listed as a -135 bet to win UNDER eight games in 2018, which could dramatically hurt Wilson’s chance of garnering NFL MVP honors. 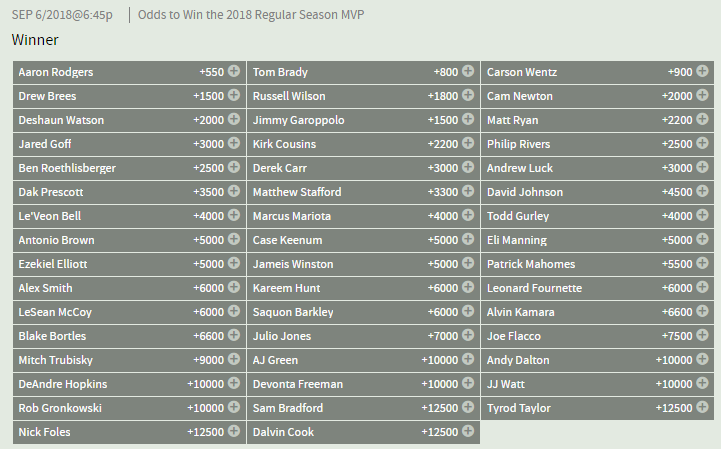 Other notables on the 2018 NFL MVP odds include Minnesota Vikings QB Kirk Cousins, who sits alongside Atlanta’s Matt Ryan at +2200. Oft-injured Indianapolis Colts passer Andrew Luck maintains surprisingly strong +3000 odds, while running backs Le’Veon Bell and Todd Gurley lead all non-quarterbacks, each with +4000 odds.